CURRENT Athens, ‘Mythology of Our Current Condition of Life - Greece’. ArtRabbit, ‘Mythology of Our Contemporary Condition of Life’ Performance Symposium by Helene Lundbye Petersen. Kristeligt Dagblad, Kunst På Magtens Tinder [Art in the upper echelons of power], by Jakob Houmann Mortensen and Leif Tuxen. iconstorm, the house of beautiful business in review, by Tim Heiler. Journal of Beautiful Business, Interview with House Artist in Residence Helene Lundbye Petersen, by Simin Radmanesh, HoBB. BCG Henderson Institute, The Human Future of Business: Hints for Future Gazers, by Martin Reeves, Léa Steinacker and Tim Leberecht. The Alternative UK, The Power of a White Page. Journal of Beautiful Business, In the Shadow of the House of Beautiful Business, by Jonathan Cook. Socialdemokraten, En Hvid Side til Socialemokratiet [A white page for the social democrats]. Altivisten, Den Gule Bog om Balance, by Amanda Glob Nielsen, edited by Oliver Riel. The Heroines Journey, The Heroine's Journey of Helene Lundbye Petersen, interview by Peter de Kuster. Altivisten, Den Grønne Bog om Kærlighed, by Amanda Glob Nielsen, edited by Oliver Riel. Altivisten, Den Røde Bog om Krig, by Amanda Glob Nielsen, edited by Oliver Riel. Altivisten, WhitePageProject: Den Orange Bog, by Amanda Glob Nielsen, edited by Oliver Riel. Altivisten, WhitePageProject: Den Blå Bog, by Amanda Glob Nielsen, edited by Oliver Riel. Altivisten, WhitePageProject: Den Hvide Bog, by Amanda Glob Nielsen, edited by Oliver Riel. Alternativet, Alternativets Huskunstner vil skabe ny begyndelse for Christiansborg. Mandag Morgen, Kunstner på Borgen vil give partier ny start [Artist in Parliament will give the political parties a new beginning], by Claus Kragh. Jyllandsposten, Alternativets huskunstner skal ruske op i Christiansborg-politikere [Artist in Residence poised to shake up the politicians in Parliament], by Peter Rosendal. Psychology Today, Gray must remain our sacred space, by Tim Leberecht. Medium, Gray Must Remain Our Sacred Space, by Tim Leberecht. Consulate General of Denmark in New York, Meet Danish Performance Artist Helene Lundbye Petersen, by Ulla Dubgaard. Getty Images, Helene Lundbye attends the Art15 Preview Night & Freedom Audit Exhibition at Kensington Olympia. FAD Magazine, Kathleen Soriano's Freedom Audit to launch at Art15. Artconnect, “Writing on White” - Finissage. Contemporary Food Lab, White - At all times food has been found to be eaten. Sugarhigh, Berlin, Culture Food Eat White: On the taste of White Performance Art at Entretempo Kitchen Gallery. Cultural Bandwidth / The Undergang Armchair, #32 Balance ft. Helene Lundbye Petersen, by Ando. Nectar, Jeg vidste, at jeg havde fundet det, jeg ville med mit liv [I knew I had found what I wanted with my life], by Tania Maria Lüders Rusbjerg. Cotton Magazine, The Writer - Q&A with Helene Lundbye Petersen, by Sidsel Solmer Eriksen. Cotton Magazine, An Ode to the Arts - The White Book, by Sidsel Solmer Eriksen. 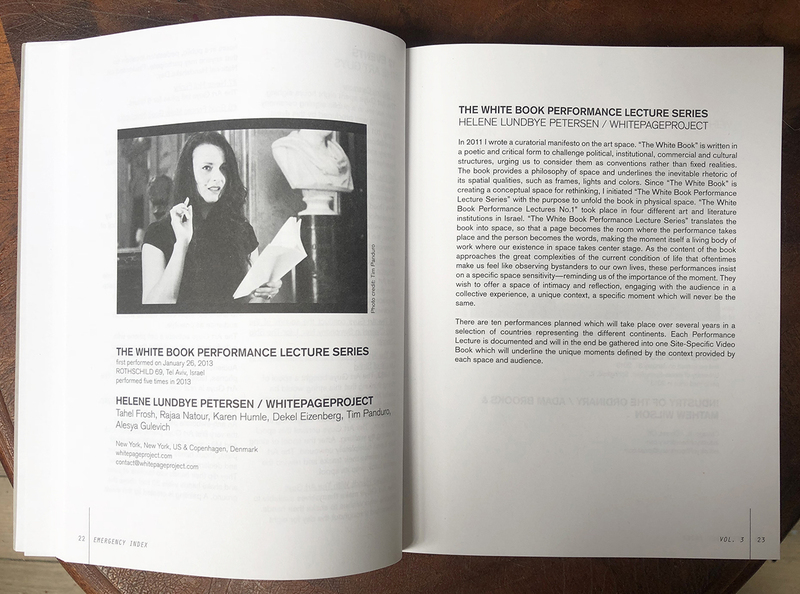 Haaretz, The White Book Performance Lectures No.1. ELLE, Månedens Kunst, højtlæsning på det Kongelige [Art of the Month, reading at the Royal Theatre of Art], by Anne Mikél Jensen. Kopenhagen, Book Release: The White Book, Kopenhagen News.